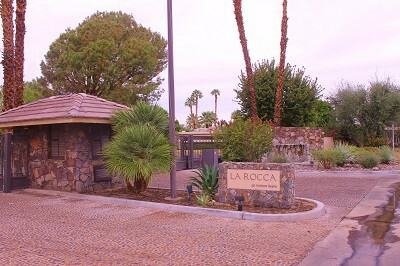 La Rocca in Indian Wells, Calif.
La Rocca Real Estate in Indian Wells. Welcome to La Rocca in Indian Wells, California, a private enclave of Condos just down the street from The Vintage Golf Club. La Rocca is very popular with both Local home owners as well as Seasonal, or Vacation home owners. If you’re looking for a Condo in a perfect location in the middle of our Coachella Valley, this intimate community could be exactly what you want! Give Kim Kelly a call today to set up a viewing, 760-285-3578. La Rocca is a gated condo community in Indian Wells, California. Home owners enjoy six pools/spas, two tennis courts, pickle ball and a 9-hole, 3 par-3 golf course, all included in monthly HOA dues. Developed in the late ‘70’s, these airy, spacious condos are 2 or 3 bedrooms with sizes averaging 1,500 square feet. The greatest thing about this community is it’s location. It’s literally down the street from The Vintage Golf Club, and the beautiful Indian Wells Street, Fairway. You can walk, bike, or golf cart ride through beautiful Indian Wells streets, or just around your neighborhood! The entry is only a 1/2 mile or so from Hwy. 111 if you feel like shopping or dining. Palm Desert and La Quinta to the East, and Rancho Mirage and Palm Springs to the West. These airy, light filled Condos are spacious, and many of them feature interior Atriums. The outdoor living areas are generous, the grounds well manicured, and the community is friendly. These Condos are perfect for year round residents, Golf Course investments, or Vacation Homes. Current HOA is approx. $550/month.